The first section of the National Blue Trail leads from the Írott-kő Mountain standing on the Hungarian-Austrian border across the Little Hungarian Plain until Sümeg town. Beside the bare plain the trail crosses the big lowland forests, as well. 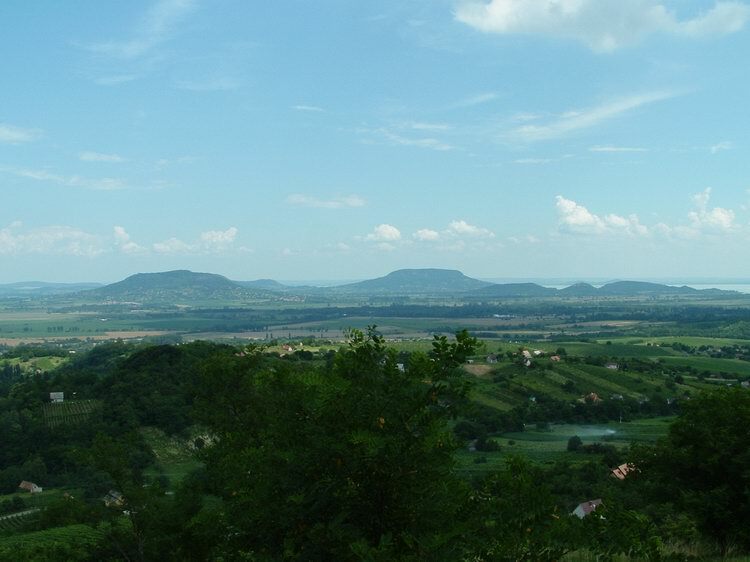 The travelogue of the second section describes the route through the hills of the Balaton-felvidék Region from Sümeg town until Nagyvázsony village. The Blue Trail visits the extinct volcanoes of Basin of Tapolca, Lake Balaton and many ruined forts. This description contains the route of the Blue Trail in the Bakony Mountains. The trail climbs the highes peak of the Bakony, the 709 m tall Kőris-hegy Mountain. The Blue Trail leads mainly in forests here, it goes only on the last kilometres across the bare easter highland. The Vértes is mountains only in its name, this region is a wide volcanic highland, which eastern part is splitted into parts by deep valleys. The almost whole route of the trail leads in forests and visits three ruined forts. One of them is accessible only on the path of the Blue Trail! Three-four hiking days are waiting for us among the mild hills of Gerecse Hilly Country. Its last 15 km long section between Mogyorosóbánya village and Dorog town is perhaps the most spectacular section of the Blue Trail with many wonderful views. This part is perhapas the most well-known section of the Blue Trail. It leads in the vicinity of Budapest, mainly on well-trodden paths and promenades. Its last 24 km long part is very spectacular and visits Visegrád Castle, as well. From the walls opens a beautiful panorama to the Danube Bend! This is the shortest section, but we have to climb the tallest mountain of this region, the 938 m high Csóványos standing in the middle of this mountains. A beautiful panorama opens from the top level of the new lookout tower to the whole Börzsöny. The Blue Trail crosses this large hilly country and visits the small villages lying in the mild valleys. The trail touches Hollókő village, which is the oldest Hungarian World Heritage Site. The two tallest mountain of Hungary is located here, in the Mátra, of course the Blue Trail visits both of them! From the lookout terrace of the TV tower standing on the top of 1014 m tall Kékestető opens a beautiful panorama! The eastern section of the Mátra on the ridge is the hardest section of the whole trail among the peaks! 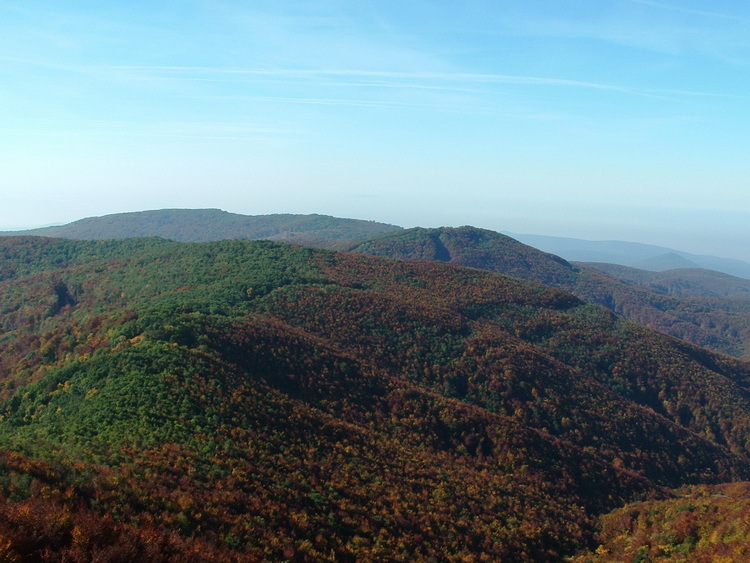 The main part of the Bükk Mountains is an about 800-900 metres high highland, the Blue Trail climbes it and visits many lookout points on the peaks standig on the edge of the plateau. The trail leads mainly in forests in this mountains. The Blue Trail crosses two mild hilly countries, and touches the two main entrances of the Baradla Dripstone Cave in Aggtelek and Jósvafő village. The cave is a World Heritage Site, similar to Hollókő village! It is possible to take the distance between Aggtelek and Jósvafő under the ground through the corridors of the cave system! Unfortunately the travelogues of the whole National Blue Trail are not finished yet, the desciptions of the two last section across the Cserehát Hilly Country and the Zemlplén Mountains are missing. If the editor will have enough time, he will write them as soon, as possibe!